Mallards (Anas platyrhynchos) are sturdy dabbling ducks that are prevalent throughout the world. These waterfowl are found in diverse location types, from swamps to tiny ponds in bustling public parks. The majority of female mallards begin reproducing when they're around a year in age. Nest construction is a key component of the species' breeding process. Mallards typically start looking for mates during the autumn months. Once winter rolls around, they usually are set in that department. Mating takes place during the months of March, April, May and June. Male mallards, for the most part, assist females in finding places to nest, mostly at night. 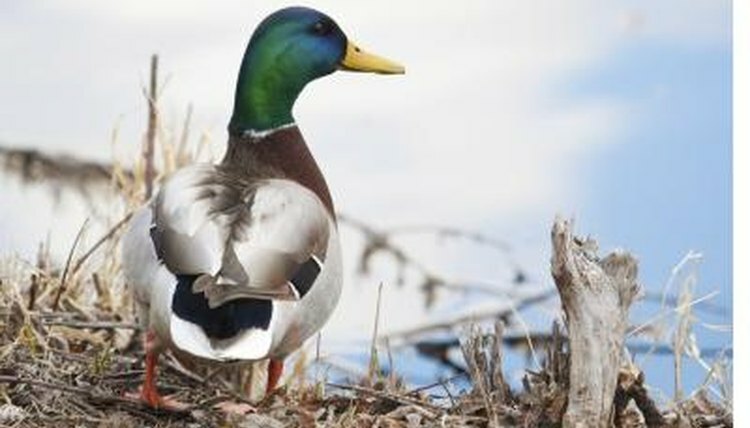 When scouting out nest locations, mallards look to the ground -- specifically damp soil. They seek out spots on terra firma, and nearby water is an absolute requirement -- 300 feet away, maximum. Mallards generally opt for shallow holes that are hidden, usually by high grass or some other type of plant. Farming sites are common nesting spots for mallards, particularly those that grow alfalfa. Oat and barley fields are also preferred settings for their nesting needs. Mallards sometimes also nest in openings of trees, over tree stumps and below thick shrubs. "City slicker" mallards occasionally even set up their nests on roofs and in areas close to swimming pools. Mallard mamas build their nests while they're already inside them. They tug on the necessary elements that are close by -- think twigs, foliage and grass. They also sometimes use feathers to make their nests, too, but only once the incubation process has started. For these purposes, the hens retrieve the feathers out of their chest areas. At full completion, mallard nests are usually around 1 foot in width. The nests also typically contain "basins" for the eggs. These basins, in depth, are usually between 1 and 6 inches. They also are usually between 6 and 9 inches wide. A mallard clutch can include a single egg, but also can have as many as 13 of them. The incubation process generally lasts 23 to 30 days. By this time, the mallard fathers are already out of the picture. The eggs are usually greenish-beige, gray or off-white in color. Once the youngsters emerge from the eggs, they are typically already wakeful. The mothers usually guide them to H20 when they're less than a day old. At that point, the little ones begin swimming. They are ready to leave mom once they're self-sufficient -- this usually takes approximately 70 days.